Three: Coco Arándito — The Old Town Alchemy Co.
Last Thursday I was lucky enough to be competing in the Scottish regional of the Gin component of Diageo's World Class competition, which involved spending the afternoon in the shiny surrounds of Hawke & Hunter. 'Course, when you get a bunch of bartenders in one place, there's only one thing we talk about and one topic stuck in my mind. Someone had mentioned that most bartenders tend to resort to similar drinks when they get asked to make something on the fly. I have a tendency for subbing ingredients into a standard Cosmo recipe (see last week's Bloomsbury Cosmo, for example), so I decided to branch out, leading to this little creation. 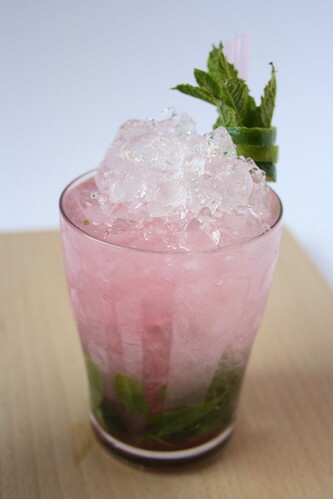 It's a simple twist on a Mojito. Muddle mint, sugar and lime juice in the base of a highball glass. Add the Koko Kanu, fill with crushed ice and mix well. Top up the crushed ice and float 25ml cranberry juice. Garnish with a mint sprig and lime wedge. Posted on January 20, 2009 by Jon and filed under Fiftytwo, Mixology, Projects, Recipes and tagged cocktails Koko Kanu mint.